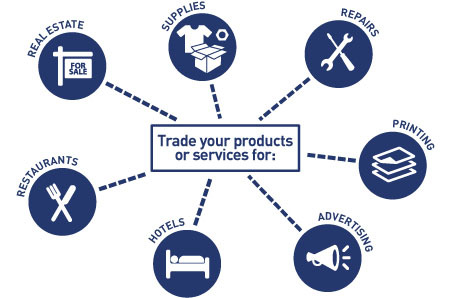 Trade your goods and services for the products, services, media and travel you want instead of spending cash. FixXchange is an online commercial barter community where products and services are traded for virtual barter dollars. But unlike one-to-one trading, FixXchange members enjoy multi-party trading... When you sell your product or service to another member, you are not limited to receiving the product or service of the company that you traded with. Instead, you can use your barter dollars to purchase anything listed on FixXchange - currently about $100,000,000 worth of products and services and growing with each new member! Enter your email address to receive more information and special offers. Any business, tradesmen or person that can offer a product or perform a service can apply for an account with FixXchange. You must agree to the trading rules and be fair and equitable in your dealings with other FixXchange members, just as if they were cash customers. Why would I want to accept Trade Dollars instead of cash? You’re not accepting Trade dollars instead of cash. You’re receiving new trade customers in addition to your cash customers. If you have idle time in your week or your shelves are overstocked, why not accept trade dollars? You can spend the new found revenue to offset business expenses, pay employee incentives, or enhance your quality of life. And quite often, trade clients will refer their cash paying friends and family when they enjoy the great service you provide them. How is bartering through FixXchange better than direct bartering? You can trade with anyone in our vast barter network. We keep track of all your transactions so you never have to worry about who owes who, and unfair trades are eliminated. We send you a 1099b for tax reporting purposes so that all of your barter activity on FixXchange is tax compliant and legal. You can have up to 99 sub accounts which allows you to share your trade dollars with your employees, subs, and family. Why should I pay cash for my products and sell it for Trade Dollars? If you have product sitting on your shelves, why not get full value for it by posting it on FixXchange for barter? If you’re in a service industry and have empty appointments, you can’t sell today’s empty time tomorrow, so post it for trade and bring in new business that generates revenue in your FixxChange account. How should I price my product or service? With FixXchange you get full value for your products and services. The price you quote to FixXchange members is the same price you would quote to a cash paying client. FixXchange is simply another form of payment, just like cash or a credit card. Remember that business owners are educated shoppers and price gouging is a volation of the trading rules. Do I have to pay income taxes on the sales I make with Trade Dollars? Yes. Barter exchanges are required by the IRS to report all barter sales at the end of each year, and we make it easy for you to report your sales. FixXchange members receive a 1099b at the beginning of each year detailing barter sales made the previous year, and you can also view your monthly statements online at any time. Remember, your business expenses are deductible whether you trade for them or pay cash so discuss your options with your accountant. The goal is to spend as much as you earn so as to not show a taxable profit. Can I sell an item for part cash, part barter? The short answer is no. FixXchange Trading Rules indicate that the first $5000 of a transaction must be 100% barter. Any amount over $5000 can be 100% barter or part cash and part barter. However, you can post gift certificates for any amount and that gift certificate can be applied to the client's total at time of service. You can close your FixXchange trading account anytime with 30 days notice. Simply send us an email of call our toll free number requesting that we close your account. Upon closing your account, any negative account balances and cash fees owed will be due in cash.